With our Mobile Production Truck we have the full advantage of a Television Studio on wheels. 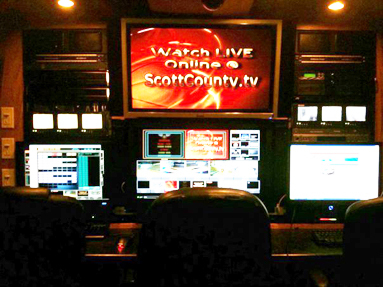 We broadcast from our location over Fiber Optics back to our head end and then out to our Local Cable Access Channel. We broadcast all of our events Live over the Internet using LiveStream. We can do productions with up to eight cameras or sources using our Broadcast Pix Slate 1000 Video Switcher. All of our A/V connections are made via patch panels located at the back of the production truck behind the monitor wall. The video patch panel has 16 BNC type connections for inputs, 2 'F' connections for cable tv feed, and two fiber ports we use at the SCSD1 campus. The audio patch panel has a Whirlwind multi-connector plug that our 22 channel snake plugs into, and 8 XLR connections we can use if we don't need to pull out the 75' audio snake. We have two 10' x 7 1/2' big screens that we feed with 3200 Lumen projectors that we use at music productions, basketball games, community events, etc.